RealTAG was built for Lenders with the simple idea that successful fundings require knowing about all the surprises, before they become surprises. If you’re tired of getting surprised and losing deals, RealTAG is for you. 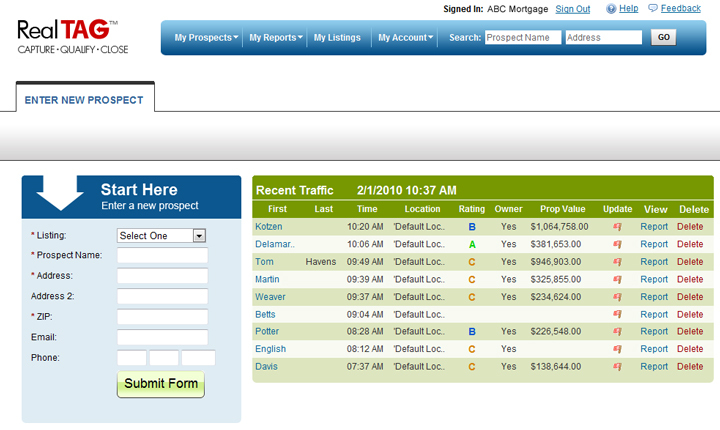 Enter your borrowers name and address and in seconds RealTAG delivers a concise financial view of your prospect. With over 225 data points on every lead, RealTAG brings industry leading AVM’s, foreclosure and N.O.D indicators, current equity, predicative modeling on 145 + million homeowners to your desktop. If you are struggling to find borrowers that qualify, let RealTAG show you the way! Designed to give lenders the ability to identify winning prospects, RealTAG will make your lending operation more effective and profitable by spotlighting the clients that can fund. The right data makes all the difference in any market. Anyone can generate a mortgage lead. RealTAG instantly spotlights those that can fund! Value confidence – Our valuation solutions power the largest banks in the U.S.
Are you ready for more clients and closings? *NEW: Upload up to 1000 past clients or farm addresses from your desktop to generate hot leads! The bottom line: If you're a lending professional, RealTAG will help you close more loans today. RealTAG was built for Realtors® with the simple supposition that the more you know about a prospect, or your farm, the more you’re likely to close. Combining industry leading predictive modeling as well as over 225 pieces of information on 145 + million homeowners, RealTAG delivers a concise financial view of your prospect in 5 seconds. 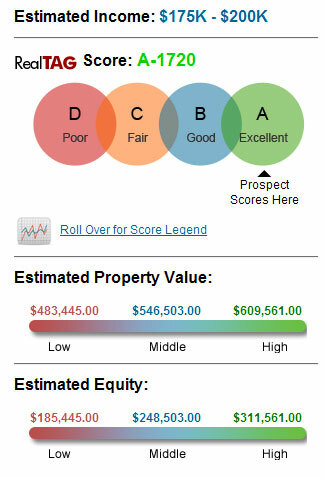 RealTAG is: Powerful real estate marketing analytics, made simple and effective. Why add RealTAG to your business? A real estate gold mine is hiding in your business... RealTAG helps you find it! The bottom line: If you're a Realtor®, RealTAG will help you achieve more sales today. Delivering qualified buyer traffic to your community is just the first part of your marketing plan. Once you have the traffic, how does your sales force target the ideal buyer? With RealTAG, you’ll know who your qualified buyers are, while they are on site. If you are struggling to find buyers that can buy, let RealTAG show you the way! Are you ready for more closings? RealTAG is: Powerful analytics for residential builders made simple and effective. You are already an expert in your market area – RealTAG will make you an expert in your client! The bottom line: If you're a marketing a small in field tract, or several communities, RealTAG™ can help you achieve new levels of success today. Call us today at 877-245-3237 to put the power of the RealTAG Developer to work for you. Our RealTAG API gives you the real estate content that drives consumers to your site, and gives you an inside look at their financial situation. 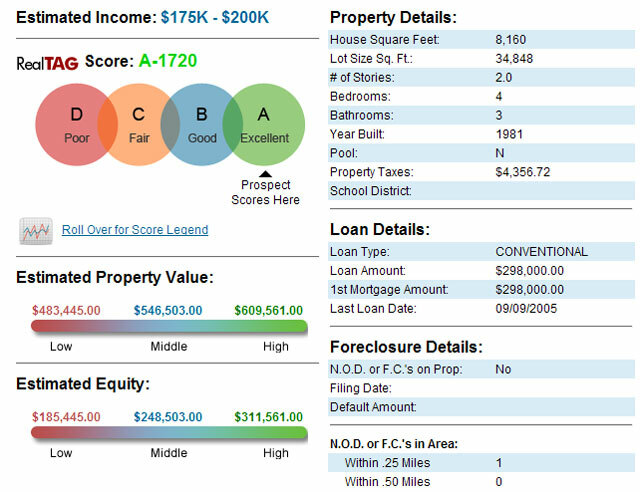 Combining industry leading predictive modeling as well as over 225 pieces of public record information on 145 + million homeowners, RealTAG delivers a concise financial view of a new prospect in 5 seconds. Why add the RealTAG API to your platform? It’s simple. Your consumer web traffic gets dynamic, personal content, and your sales staff get’s high quality prospects! Easy to integrate into your current site, allows you to generate leads with high accuracy (vs. consumer input), the RealTAG API is a SOAP based service that requires only a prospect’s name and street address and zip code as input. Current value of their home? Loans listed on their property? ASK US: Additionally, we have a full suite of predictive analytics that can be added to your API feed. These innovative "LeadScore’s" tell instantly whether you have an A, B, C or D prospect based on our industry leading models, so that you can focus on the best leads first! The next generation of Internet real estate and mortgage lead has arrived. Call us today at 877-245-3237 to put the power of the RealTAG API to work for you. Real Tag is a product of iLeads.com, LLC which Combines predictive modeling with more than 225 pieces of dataon 145 + million homeowners. Get more information today at (877) 245-3237.